My friend Mikah said it best when we walked into Five Points Pizza for the first time – it doesn’t feel like a “new” restaurant, even though it is. And she’s right: The place already feels well-seasoned and comfortable and they haven’t even opened the doors to the public yet. The grand opening is tomorrow, September 6, at noon. The restaurant was created by some friends of mine, Tara Ertischek Tieman and David Tieman, self-proclaimed “recovering attorneys,” who came up with the idea for the NY-style pizzeria in the Five Points neighborhood, along with a third partner, Tanner, who helped create the successful Sticky Fingers BBQ chain across the Southeast. I had the great privilege of getting a sneak preview of Five Points Pizza in East Nashville last week during their friends and family event, and boy was it a treat. The space, long before it was the bike shop East Side Cycles, was a grocery store. The original grocer now owns the building and is the pizzeria’s landlord. He had some old black-and-white photos of the space as a grocery store from way back when. These now adorn the booth-side of the restaurant. On the opposite wall is a giant painting, in vibrant primary colors, featuring an abstract jazz band, painted by a friend of theirs (which you can kind of see in the reflection of the photo below). They have big ambitions to offer something for everyone in East Nashville. With a mix of Bob Dylan, Andrew Bird and Bruce Springsteen on the radio, the vibe is relaxed yet up-beat. The pizzeria will be open six days a week (closed Tuesdays, after their grand opening), noon to midnight on weekdays and until 2am on weekends. They want to be a place families can bring kids, a place to grab late night pizza-by-the-slice in a neighborhood that doesn’t offer much after 10pm, and even a place to catch a football game – there’s one flat-screen TV above the bar. Though the TV will be turned off unless there’s a game on – a detail I really appreciate. Now, to the food. Five Points Pizza remains true to its motto. With the exception of three salads and two appetizers, the menu is devoted to hot pizza and cold beer. The dough for their NY-style pies is made from scratch daily, aged in-house, hand-tossed and baked on two-inch bricks in an old school gas-fireddeck oven. It’s thin crust and crispy, but still has achewiness. Before I just glaze right over the appetizers, I need to show a little love to the Antipasto Platter. Holy crap. With roasted peppers, marinated artichoke hearts and briny kalamatas; prosciutto, Genoa salami, provolone and fresh mozzarella, this is one of the best antipasto plates I’ve ever had. They’re using really quality ingredients on this platter and you can tell. The plate is $15 but worth every penny. We also tried the oily garlic knots with marinara ($5) and the Capres e salad ($10) which featured dark reddish purple tomatoes and moist, pillowy mozzzarella. While they tomatoes weren’t sourced locally, they were extremely tomato-y, a far cry from the light orange, anemic-looking, tasteless supermarket variety you so often find. Finally, the pizza. I got so caught up taking pictures of the space and jotting notes that I forgot to actually photograph the pizzas. Take a peek at their Facebook Page (and “like” it while you’re at it!) for some pizza pics. (They’re also on Twitter.) All pizzas come in 14″ and 18″. If you build your own pie, you can choose from lots of different fruits and veggies (broccoli to pineapple plus all the classics), cheeses and meats. One-topping pies start at $13 for a 14″ pie and $16 for an 18″ pie. Additional toppings are a few bucks more, depending on the topping and pie size. They also offer eight specialty pizzas including a Sausage Ricotta pie and a Pizza Bianca (white pizza). These range from $15 to $24 depending on size and toppings. Because we’d ordered so many appetizers that night, we stuck with trying slices only. Each day they’ll offer different pizzas by the slice and on this particular day the options were cheese ($3.25), pepperoni ($3.75), artichoke hearts and feta ($4), pepperoni, green peppers and black olives ($4) and prosciutto, fresh basil and pecorino romano ($5). While a $5 slice of pizza might not be everyone’s choice, as a food dork, I appreciate the options. If I’m feeling frugal maybe I’ll opt for cheese; but most often I’d probably go for one of the specialty offerings. On the night we were there, I tried the artichoke feta and it did not disappoint. The beer selection ranged from drafts of Yazoo to cans of Porkslap and lots in between (no liquor). Speaking of the bar, make sure you pay special attention to the wooden bar area with stools (perfect for scarfing a slice of pizza) in front of the actual bar. Tieman made it himself from an old piece of wood. It’s touches like these that lend the character, charm and sense of a place to Five Points Pizza in a way that feels unusual for a restaurant that hasn’t even opened its doors. Once you’ve tried it out, please report back! I’ll be curious to hear everyone’s thoughts. So, I’m pretty excited about something new I’ve been working on. My friend Paulette and I are hosting a series of culinary tours right here in Nashville! Paulette is the publisher and editor-in-chief of Alimentum Journal, a literary review all about food. She also teaches Italian-themed cooking classes here in Nashville. We both share a love of food and travel, and thought, “why not?” Nashville has a lot to offer food-wise, especially when it comes to ethnic eating. We wanted to plan something to make some of the more off-the-beaten-track places more approachable. Our first tour will take a group of 10 to Nolensville Pike. The nuts and bolts are below, from a recent press release. Also, check out Chris Chamberlain’s awesome Bites post from the Nashville Scene. What: Guided tour costs $95 per person, limit 10 people. Tour includes transportation (from group meeting point, TBD), lunch and tastings from an assortment of restaurants, markets and bakeries along the Nolensville Pike corridor, the latest copy of Alimentum Journal, and fun times with fellow local foodies. Why: To wake up your palate, push your culinary limits, and expose a relatively untouched world of ethnic dining in our own backyard. And honestly, why not?! To buy tickets and learn more, please visit http://www.alimentumjournal.com/eat-and-greet or email events@alimentumjournal.com. 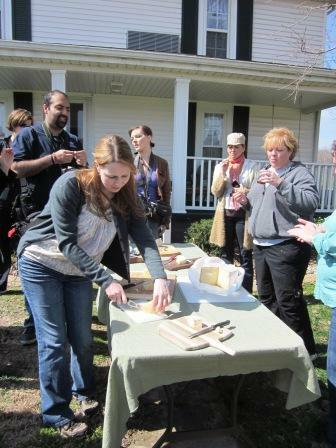 The next tour will be October 22 and will be to a local farm. Details to come! Please feel free to ask questions here, or email us at the above address. Hope you can make it! Do you subscribe to Cook’s Illustrated? Well if not, you should consider it. 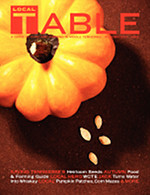 I learn so much about food and cooking through this excellent publication. I love the notes from readers, sharing tips and asking questions. The “What Is It?” section is neat, too — they include a sketch of an often antique cooking device and explain its origin and meaning. And the “Quick Tips” section is s o useful. In the latest issue I learned a trick for trussing chicken if you’re out of kitchen twine (use a leftover wire champagne cage to twist around the legs!) and a good suggestion for squeezing the liquid out of cooked spinach (place spinach in a colander, then use a glass or metal bowl to press out the liquid). Genius. The recipes are diverse and they provide a ton of background info on why things turn out the way they do. This publication is truly a culinary treasure. There’s also a great online database of all their recipes you can pay to use, and I’ve heard their cookbooks are fab too, though I haven’t used them. If you’re serious about cooking (or getting serious about finally getting serious about cooking), subscribing is a great first step. In the last issue, there was a great recipe for panzanella salad. This Italian Bread salad is one of my favorites, and a great use for the all the tasty tomatoes available right now. When I bit into my first tomato of the season, I realized I rarely eat tomatoes out of season anymore. The anemic, flavorless supermarket variety just really don’t cut it for me. But back to the salad. Panzanella is a great way to use up stale bread. Seems like every culture has a use for stale bread – the Mexicans have chilaquiles to use up stale tortillas, the French have their toast, and I’m sure there are a million others. I often make croutons with stale bread. In the mood for more tomato recipes? Check out some from some blogger friends of mine, Adrien, Vivek, and Beth. I haven’t tried any of these yet, but I will. They all sound so scrumptious! So, to kick off the Panzanella, check out these beauties, straight from the garden. The recipe calls for 1.5 lbs; this is a little under two. First, preheat the oven to 400 degrees. Then chop up the bread. I used some white Italian bread and a-touch-past-its-prime whole wheat sandwich bread. Toss it with some olive oil and salt, then spread it out on a baking sheet to toast. I added some whole cloves of garlic as well. After you chop and seed the tomatoes, you need to let some of that juice drain out. Strain the tomatoes in a colander sprinkled with a bit of salt. I stirred them around a few times to help with this. Once the tomatoes have drained, mix up the dressing which is a classic vinaigrette plus some tomato liquid. I love using the tomato liquid in this way! Do you all use jars to make your dressing? It’s so much easier than the drizzle and whisk method. You just toss everything in and shake. Granted after a few minutes the dressing will start to separate, but if you add it to your salad right away you’re fine. Then, mix it all together and voila! Summer on a plate. Make sure you don’t add the toasted bread until right before you’re ready to eat or it’ll get quite soggy. Any Cook’s Illustrated fans out there? Tell me why you love the mag. And, please share any tips you’ve learned. (Headnote and recipe from Cook's Illustrated, July 2011) Panzanella recipes benefit from the liquid exuded by the tomatoes, so we tossed them with some salt and let them drain in a colander until they’d shed a good bit of juice. Using that juice in our Italian Bread Salad’s dressing boosted its fresh flavor. Staling the bread in the oven until it turned golden brown gave our Panzanella a nutty flavor and allowed the dressing to lightly saturate the pieces of bread before we stirred in the tomatoes. 1. Adjust oven rack to middle position and heat oven to 400 degrees. Toss bread pieces with 2 tablespoons oil, ¼ teaspoon salt and garlic; arrange bread in single layer on rimmed baking sheet. Toast bread pieces until just starting to turn light golden, 15 to 20 minutes, stirring halfway through. Set aside to cool to room temperature. 2. Gently toss tomatoes and ½ teaspoon salt in large bowl. Transfer to colander and set over bowl; set aside to drain for 15 minutes, tossing occasionally. 3. Whisk remaining 6 tablespoons oil, vinegar, and ¼ teaspoon pepper into reserved tomato juices. Add bread pieces, toss to coat, and let stand for 10 minutes, tossing occasionally. 4. Add tomatoes, cucumber, shallot, and basil to bowl with bread pieces and toss to coat. Season with salt and pepper to taste, and serve immediately. As a self-proclaimed foodie with professional experience in the food and nutrition industries, I would consider myself more educated than the average bear about gluten intolerance. That is, until a very dear friend of mine with a sensitivity to gluten came to town the other week from Portland, Ore. I know she doesn’t like to make a big deal about her gluten issues, so I (attempted to) plan ahead. I live in East Nashville, so on the day of her visit I picked up some Almond Thin crackers (gluten-free) from the Turnip Truck, and made sure I was stocked with fruit, yogurt, juice and nuts so she’d have lots to snack on while she was here. So far so good. According to the Whole Grains Council, gluten is a protein found in grains such as wheat (including farro, spelt, durum and others), barley, rye, tricticale and oats. Oats are a tricky one as they’re inherently gluten-free but can become contaminated during processing. Gluten issues aren’t the same for everyone. Some people are completely intolerant and require a dedicated kitchen that’s free from all gluten-containing elements. Some, like my friend, just have a gluten sensitivity, so if she has a nibble of something with gluten, she’ll be uncomfortable later but it’s manageable (or so she says). Beyond grains, gluten can be hidden in all kinds of things to soups and sauces to condiments and spreads (often it’s used to thicken things). Celiac disease is an autoimmune form of gluten intolerance. But not everyone who has a sensitivity to gluten has Celiac disease. I’ve also been told that gluten intolerance is NOT an allergy. Nutritionist friends and those that are educated about gluten intolerance please jump in and correct me here if I’ve misspoken on anything. The first evening of her visit, we’d planned to see a concert at Mercy Lounge. So, budget-minded and ever-so-thoughtful friend that I am, I decided to take her to Eastland Cafe for their award-winning happy hour menu with lots of heavy apps and drinks for just $5. I screened the happy hour menu in advance, and thought I’d identified several options on the menu that would be substantial enough for dinner. Fail #1. 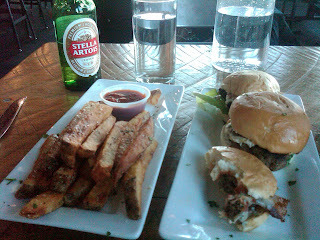 I chose Eastland as my other go-to places for a tasty yet affordable dinner close to home (Burger Up, Silly Goose, Cooper’s) seemed to have a lot of gluten-y (word?) items on the menu, and I wanted her to have options. Please note this is no slam against Eastland Cafe. I did not call ahead to ask, and when we got there, we had about three minutes to order before happy hour ended, so we weren’t able to see if the server would make any substitutions. — Fish tacos – I assumed there would be the option to get them grilled or fried, right? WRONG. They were fried, and thus contained a light breading with gluten. They also did not come with corn tortillas (but again, we didn’t have time to ask). — House-made hummus with olive oil – I thought, “well it comes with carrots on the plate in addition to the pita, so that should be okay, right?” WRONG. Do you know how not-fun it is to eat wimpy carrot sticks with your hummus when there is a giant pile of gluten-laden, freshly grilled pita bread, steaming in your face? It’s not fun. — Vegetable spring rolls – They’re made with rice paper, right? Not always. I think they were won-ton wrappers, but whatever they were they definitely had wheat in them. After a quick google search I learned that if you’re making any sort of spring or Asian roll, you need to expressly make sure the wrapper doesn’t have gluten in it, as I guess that’s pretty common. — Housemade smoked jalapeno pimento cheese – Both my friend and I are originally from Ohio so I thought I’d introduce her to this certain Southern specialty. Same problem here as with the hummus and pita — the celery was kind of sad next to the sturdy, salty pretzels. Now we did ask for extra celery and carrots for our various dips, but wow was this a big fat fail! Instead of a gluten-free feast I basically fed her a dinner of poison. Luckily my girl is low maintenance and kind, so she toughed it out. And the cocktails were tasty. The next day for lunch I took her to the Local Taco in Brentwood for lunch. Mexican can be safe for those with a gluten sensitivity as the tortillas and chips are often made of corn, which doesn’t contain gluten. After lunch, I was feeling better about my restaurant choices and announced that I planned to make a barley risotto with lots of garden veggies and Parmesan for dinner. Oh, Annakate. Barley is one of the no-no grains as well. Fail #2. Again, my friend was super nice about it and reminded me that that wouldn’t really work, so I laughed at myself and quickly changed the subject so as not to dwell on her gluten intolerance the entire trip! When I had a free moment I googled “what has gluten” on my iPhone in the bathroom and worked out an alternate plan for dinner (tilapia simmered with a tasty Trader Joe’s Indian Simmer Sauce with chickpeas, spinach and jasmine rice. Sigh. My friend is so not a pain, and gracefully rolled with the punches each time. In a way, I’m glad I had this experience because I learned a lot. I wanted to post this blog entry to share with others so maybe someone else wouldn’t make the same mistakes. 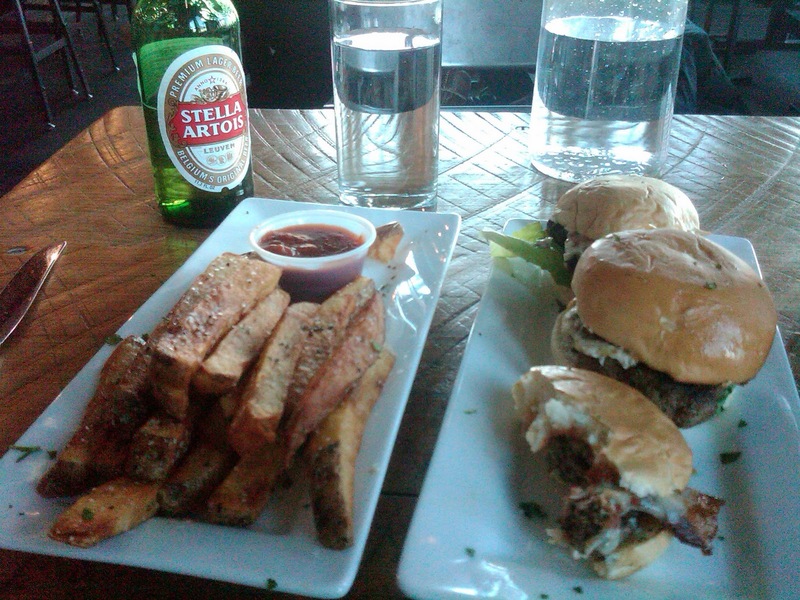 After she left I did some further research on gluten-free restaurants via bloggers who cover this topic in Nashville. I’ve just listed a few restaurants/bloggers here. Please contribute your favorite gluten free-friendly restaurants/blogs in town as well! Gluten Free Cat Heather has a lovely blog and writes about many of her personal experiences at restaurants in Nashville. Do a search for “Nashville restaurants” in the search bar on the bottom right for a few suggestions. She also has a link for gluten-free products and resources at the top. Gluten Free Nashville I don’t know this blogger personally, but she has a great roundup of gluten-free restaurants in town. I’m sure there are tons more! Of course, on all these places, make sure you call ahead to confirm it’s safe for you or your friends. A chef friend of mine, once shared an awesome secret for a recipe utilizing leftover pasta noodles. I’ve kept it logged in the giant recipe file in my brain, but had never tried it until last night. And I’m so glad I did! The recipe is for a spaghetti pie of sorts, and is easy, low in fat and a great use for that pasta in the fridge that no one is going to eat. As a person who hates HATES to waste food, I love this whole concept. We also don’t have a microwave which usually isn’t a problem, but reheating leftovers like pasta is one thing I do miss having a microwave for. The secret to this recipe is finishing the “pie” in the oven. You begin cooking the egg on the stove to make sure the outsides are set, then pop it into a 350 degree oven for 10ish minutes to set the middle. It’s so elegant, delicious, and great for breakfast, lunch or dinner. I googled “spaghetti pie” before making this to check on ingredient ratios and was pleasantly surprised to see a number of recipes pop up, including one even from Emeril. Apparently this is something other people know about. Have you ever had spaghetti pie? I used leftover whole wheat angel hair pasta with pesto on it in this recipe, but you could use anything. If yours doesn't have any sauce, make sure you toss the pasta with some olive oil and herbs or a quick tomato sauce before adding it to the skillet so it stays moist enough. 1/2 to 3/4 cup of assorted vegetables such as chopped broccoli, thawed frozen peas and/or halved grape tomatoes, etc. 1. Preheat oven to 350 degrees. Heat small, ovenproof non-stick skillet* over medium-high heat. Once skillet is hot, add olive oil. Add onion, and saute until translucent but not brown, stirring occasionally, about 5 minutes. Add assorted veggies and cook until bright green or beginning to cook through. 2. Meanwhile, in a medium bowl, whisk together the eggs, milk, cheese and a pinch of salt and freshly ground pepper (to taste). 3. Add pasta to skillet and toss to combine with veggies. Pour egg mixture over top making sure it thoroughly combines with pasta and hits the bottom of the skillet. Add an additional egg if mixture looks dry or doesn't fill skillet thoroughly. Cook over medium heat for 7-10 minutes, or until sides are set. Transfer skillet to oven and cook an additional 10-15 minutes until center is set. 4. Remove pie from oven and allow to cool slightly. With a rubber spatula or butter knife, loosen edges from pan. Being careful not to burn yourself, put a cutting board or plate on top of skillet and flip, inverting pie onto cutting board. Slice, and serve immediately or at room temperature. *If you don't have an ovenproof skillet, put aluminum foil around plastic handle to protect it from the heat. So, I’m part of a group of food bloggers in Nashville, and periodically we get together to go on food outings. And it’s awesome. I feel really lucky to have gotten linked up with these folks. I have a nice group of friends here, and I love them, but it’s refreshing to get together with a group of like-minded foodies so we can really get into it about food and cooking. I’ll tell you, the super-foodie geek-factor really skyrockets when this group gets together (and I love it!). Case-in-point: Conversations I overheard at a recent Whole Foods event included: “Did you hear about the new Filipino food truck in town?””Do you guys have a good source for buying dried fruit without added sugar?”and “What does everyone think about the new format/style of Bon Appetit magazine?” OK, those last two comments were mine, but I got great responses from friends in the group! People really know and care about food, and they want to talk about it, and I so appreciate that. A WF rep gives us the scoop on bulk bins. OK, on to the reason for this post. As I mentioned, about two weeks ago we all got together at the new Whole Foods in Cool Springsto take a tour of the store. We visited different stations (i.e. 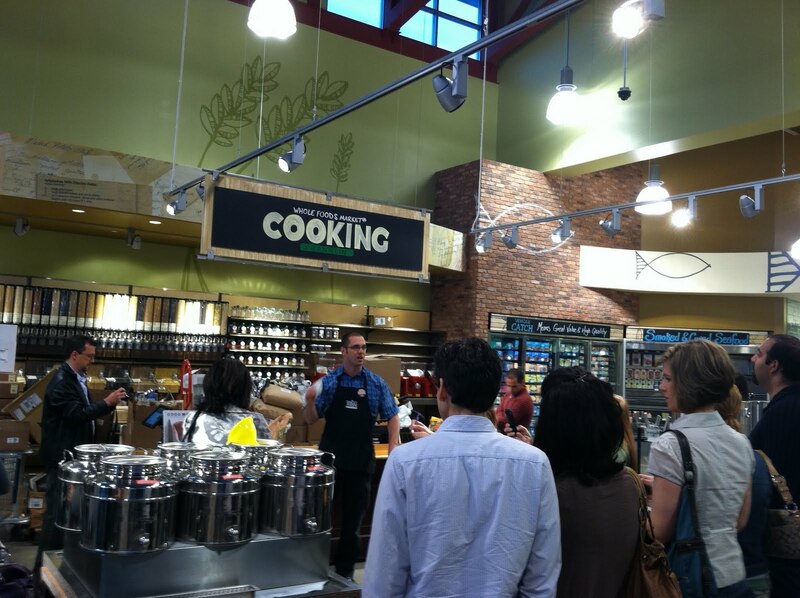 produce, health/beauty, meat/seafood counter) and got a short overview on the highlights of each from representatives. I have to say, it was really impressive. I’ll admit though, I’m not a very regular shopper at Whole Foods as it is (I’m cheap, and the closest location to me is in Green Hills, a really congested part of town), so I didn’t have much to compare the new store to. But I wanted to provide some highlights of what I found innovative and exciting. You can buy lots in bulk, and they encourage you to bring in your own containers to fill. Many standard containers have already been pre-weighed (like various sizes of mason jars) so the cashier just hits a button when you bring your quart-sized mason jar filled with French green lentils up, so they’ll automatically be able to subtract the weight of the jar from your order. If you have a more unique container, you can easily get it weighed when you enter the store for ease in checking out later. As far as the bulk items go, while they’ve got the regular dried beans, legumes and grains (and there are lots of different kinds!) you can also buy things like granola, nuts and even laundry detergent in bulk. I like buying in bulk because 1) it’s often cheaper, 2) you have no packaging to throw away and 3) you can get the exact amount you want. They also have bulk spices, so if you just need a teaspoon of, say, turmeric, a spice you don’t use that often, you don’t have to buy an entire jar and risk most of it getting old before you can use it. They have a ridiculously expansive meat (fresh, smoked and cured all have their own cases) and seafood section. The meat looks so glorious! There’s a focus on local sourcing, and what’s not local has clear labels indicating where it came from and other pertinent information (like sustainability factors for seafood). The store is also hosting the Tuesday Franklin Farmers’ Market in its parking lot. The market was being housed at The Factory, but there’s not a lot of traffic over there on a Tuesday, so hopefully the market gets more foot traffic at its new location from 3-6:30pm on Tuesdays. 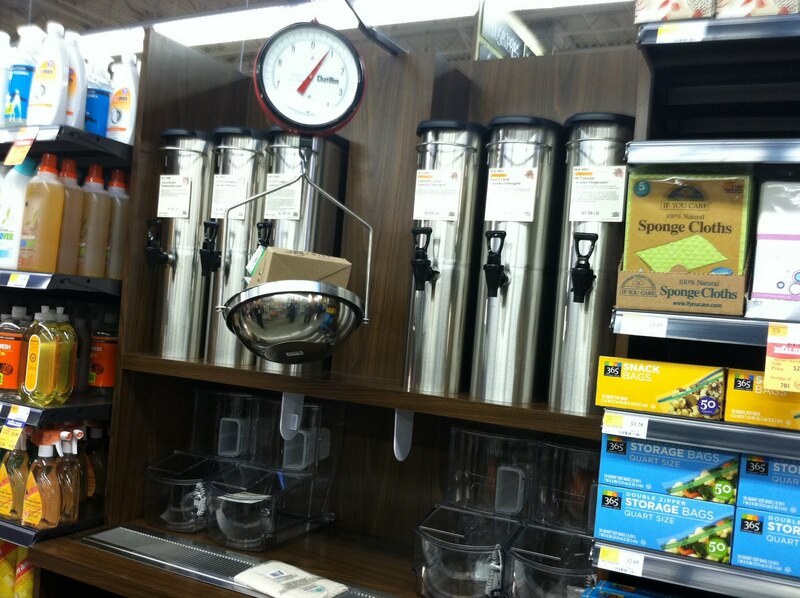 The prepared food section is great. 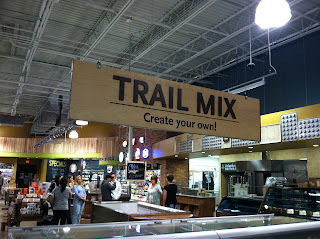 I realize the prepared foods are a staple of most Whole Foods stores, but this one even had details such as a trail mix bar (!!). You can mix your own containers of trail mix, choosing just what you want. All in all it was pretty awesome over there. While Whole Foods will still be a destination store over a place for staples for me, this tour definitely reminded me of all the cool stuff they have to offer. The next time I’m in a cooking rut, I’ll have to pop down to get inspired. Then I’ll of course have to meet up with my Nashville Food Blogger pals for more inspiration — and to get geeky over food. 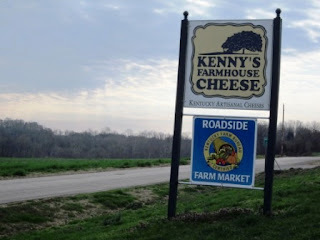 I was among a lucky group of Nashville food bloggers and writers who got to on a visit to Kenny’s Farmhouse Cheeses in Austin, KY, this weekend. A van picked us up in East Nashville around 7:30 a.m., and we started the scenic drive north. During the car ride we talked about almost nothing but food, recipes, cooking, restaurants — you name it. It’s really refreshing being with a group of like-minded foodies, I must say. When we arrived, we were treated to an assortment of baked quiches from Roxy Baking Co., a regular vendor at the Nashville Farmers’ Market. After that we quickly switched gears to cheese. 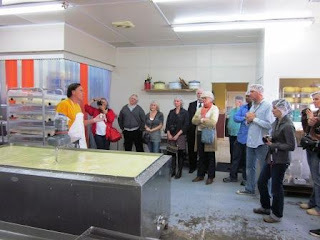 Kenny gave us a short history of his cheeses, explained the process of cheesemaking and gave us a tour of his facilities. I always enjoy learning the story behind a product and meeting the people who make it. It gives whatever it is — chocolate, bread, homegrown meats — more meaning. Kenny started making his cheeses as a way to add value to his dairy farm. He was first inspired to try his hand at cheesemaking from what he saw on family farms in Europe. Then, between his mother, who made cheese on a small scale for the family when Kenny was a child, and a family friend and mentor in Canada, he began to try his hand. During their first year of cheese production they made 4,000 pounds of cheese. Last year it was nearly 70,000. They started out making gouda, and now have everything from asiago to cheddar to havarti. The havarti variety, he says, was actually an accident. He started with a batch of cheddar. When it was time to add in the live cultures, he realized he was out of the kind he needed for cheddar so he added in some gouda cultures. After awhile, he realized he was making something very different than cheddar, so he called up his mentor in Canada and she said simply, “well, it sounds like you made havarti!” And they’ve been making the variety ever since. Kenny with the family dog, Cheddar. Two things really struck me during this visit. Because of the way his production is set up, Kenny’s cheese leaves a very small carbon footprint. 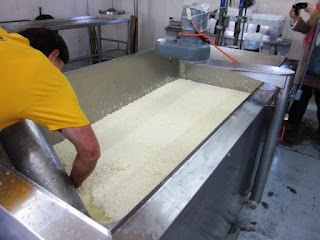 Milk needs to be around 90 to 100 degrees to begin the cheesemaking process. Since the cows that provide the milk are right next door to the facility, the milk doesn’t have to travel far, and, because the cows are milked that morning, it’s already at the right temperature when it’s pumped into the cheese “laboratory” so it doesn’t require additional heating. Because the milk is so fresh, it doesn’t require pasteurization, which some say can change the flavor. The other thing that struck me was the crafsmanship behind the cheeses. I’ve often thought that my generation has really lost interest in creating something with our hands. For so many people, typing on the computer is the only thing their hands are used for. Plus, so many things are mechanized these days. Where there was once an art — furniture-making, embroidery, sewing — we now have a machine-based process. However, Kenny, and many other artisan food producers are following their passions and creating a truly beautiful product. It’s really refreshing. When Kenny first started making his cheeses, he says it was a confusing and challenging process. At one point his mother realized he was getting discouraged, so she sent him up to the Louisville Farmers’ Market where his cheese was sold. He’d built up a strong following among his customers there, and his mom thought it would do him good to see the excitement from their perspective. She was right. 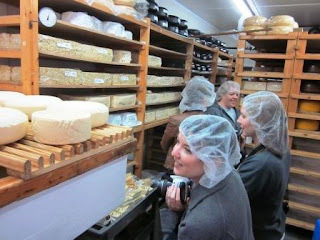 After the tour, we got to sample about eight varieties of Kenny’s cheese. My favorites were the Brie, Norwood and Kentucky Blue. The Brie had the most delicious rind on it. It wasn’t too hard or soft, and had the perfect “bite” to it. The inside was so creamy and soft, but not too runny. The Norwood was a harder cheese that I’m told is like a gruyere. It would pair excellently with a grainy mustard. I purchased some and intend to make grilled ham and Norwood sandwiches, with a grainy mustard and maybe some chutney or apple slices. They call the Kentucky Blue a “gateway” blue. It’s not as stinky as some blue cheese can be, but it definitely has a blue cheese essence, even if it is a bit muted. I loved the flavor of this cheese. After our cheese tasting, we went inside for lunch from a couple of aspiring food truckers. B.J. and Carlos, of Riffs Food Truck, cooked up quite a feast for us, featuring some of Kenny’s Cheeses in their dishes. Our lunch started out with a panzanella salad with cornbread croutons. It was followed by mini grilled brie sandwiches with jerk-seasoned pork tenderloin and homemade chutney, and cheese grits with salt cod fritters and homemade lime aioli with a kick. YUM! If that wasn’t enough, they served us a savory bread pudding with tomato marmalade for dessert. It was really a spectacular day. It’s days like this that remind me how sweet life can be. Good food, great people and a beautiful sunshiny day in the South. Is this my blog? Hello? Where am I? Wow. It’s been awhile. Do you feel like you’re in an emotionally abusive relationship with this blog because it keeps making promises that it’ll be updated more often with new kinds of posts and then it lies? Because I do. I thought I’d take the summer to reevaluate the blog, its name, its look, etc. And I suppose I did do that – think, that is. But I came to few conclusions. The only thing I concretely determined, in fact, was that I’ve spent too much time thinking about my blog, and way to little time writing. So I’m back! And this time, no more broken promises because I’ll stop promising all together. Instead, I’ll work on my blog material: the cooking part. 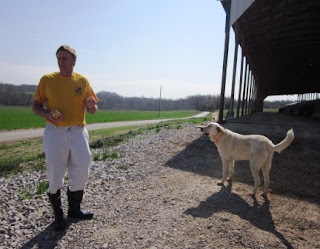 I’ll get back in the kitchen and dream up some questions and inquiries about food and farming, which we can discuss here, as often as I can, which may not be the often. How’s that? It’s a win-win! If anyone is still reading this, thanks a lot. Hopefully we can still be friends. It’s a quandary shared by many small farmers today. “We had to find a way to sell the farm, without selling the farm,” says Chris Rinehart, co-owner of RiverView Mounds Century Farm, located near Clarksville, Tennessee. Not wanting to sell the land, and not interested in continuing to farm traditional row crops such as corn and soybeans like his father, Chris and his wife, Scarlett Mulligan, set out to find a new way to make a living on their family’s farm. Prior to farming, the couple spent time in the military and eventually moved to Spokane, Washington, with their son, Miles. There, Scarlett earned a degree as a physician assistant and Chris pursued a master’s degree in philosophy. When Chris’s father fell ill in 2006, the couple decided to return to their roots in Tennessee to spend time with family and raise their children (their daughter Harloew was born shortly after the move). It was also time to deal with the 375 acres of farmland that would soon be left to Chris and his brother. After some soul-searching, along with lots of research, and guidance from organizations like University of Tennessee-Tennessee State University Extension Offices and Pick Tennessee Products, Chris and Scarlett found the answer. They decided to turn the farm into an agritourism destination, to educate kids and families about life on a farm. “For us, it’s about closing the gap between the food and the table,” says Scarlett. The passion that Kean describes, along with their unique blend of fun, educational on-farm events and alternative crops such as blueberries and Chardonnay grapes, recently won them the title of Tennessee’s Small Farmer of the Year 2010 from Tennessee State University. RiverView Mounds is also a certified Tennessee Century Farm. In the fall of 2008, Chris and Scarlett celebrated the farm’s 175th anniversary with their first Fall Festival, offering hay rides, pumpkin-picking, a corn maze, and barnyard animal feeding activities. They will kick off this year’s Fall Festival on September 11, and will follow that with Country Christmas 2010, beginning on November 26. Their busy roster of activities also includes hosting school groups. Kids learn about farm animals, plant life cycles, and seed-planting, and they can take a hayride out to the farm’s Mississippian Era Native American mounds. The mounds, which were recently added to the National Historic Registry, are also the origin of the farm’s name. Upcoming plans include providing produce through a CSA (Community Supported Agriculture program), and selling cut flowers and year-round produce from two greenhouses that Chris built. They’ve also applied to the Tennessee Agricultural Enhancement Program, a cost-sharing program for farmers, to build a Discovery Barn where kids can participate in farm activities such as churning butter and composting.